The battle against pure hydrocodone continues, with a senator joining the fight against Zohydro. U.S. Senator Joe Manchin (D-W.Va.) has sent a letter to the U.S. Department of Health and Human Services (HHS) Secretary Kathleen Sebelius, in an attempt to overrule the US Food and Drug Administration’s (FDA) approval of Zohydro. Zohydro’s potential for addiction is extremely high due to the drug's potency and there is evidence to support that the risk of overdose among patients is high as well. Many lawmakers are up in arms over the fact that the FDA’s own panel of experts voted 11-2 against the drugs approval. Last year, 28 attorneys general wrote to the FDA’s Commissioner Dr. Margaret Hamburg in an effort to stop the drug from being released on the market. What’s more, a month ago, a coalition of health groups wrote a letter to Commissioner Hamburg stating their concerns about Zohydro's impact. I write to respectfully request that you overturn the Federal Drug Administration’s recent approval of Zohydro Extended Release (ER), a powerful and dangerous opioid drug product with a high potential for abuse. For inexplicable reasons, the FDA approved Zohydro ER despite strong opposition from its own Anesthetic and Analgesic Drug Products Advisory Committee, which voted 11-2 against allowing Zohydro ER to advance in the approval process. Simply put, the FDA’s approval of Zohydro ER, in its current form, must be stopped before this dangerous drug is sold to the public. Zohydro ER is a controversial new prescription painkiller, which has up to 10 times as much hydrocodone as Vicodin and Lortab and will come in a formulation that can be easily crushed, snorted and injected. The prescription drug problem ravaging our nation, and our youth, is already an epidemic. Drug overdose deaths, including those from hydrocodone and hydrocodone combination products, have increased significantly every single year for over a decade. Indeed, 16,000 Americans die each year from abusing opioid painkillers, like hydrocodone. It’s no wonder the FDA finally decided in October of last year to reschedule hydrocodone combination drugs to Schedule II, despite taking more than 14 years to properly evaluate all the evidence. I applaud this long-awaited decision and am eager to see it finalized during the rule-making process. However, I am perplexed that the FDA decided the very next day to approve Zohydro ER, the most powerful hydrocodone drug ever. How can the FDA exhibit its awareness about the addictive nature of hydrocodone by recommending reclassification, but then approve a powerful hydrocodone drug which can be easily abused? Its inability to provide a satisfactory answer necessitates your involvement. I am deeply troubled that the reason for Zohydro ER’s approval may be linked to allegations that the FDA gave manufacturers of prescription drugs the opportunity to pay thousands of dollars for the privilege to attend private meetings with FDA officials. The Washington Post and the Milwaukee Journal Sentinel reported in October of 2013 that each company paid as much as $25,000-$35,000 to participate in these pay-to-play meetings, giving them undue influence over FDA’s approval process for prescription painkillers. Allegations have been raised that a new, scientifically questionable methodology for drug approval was created at these pay-to-play meetings. If true, we have an alarming explanation for the indefensible decision of the FDA to approve Zohydro despite the FDA’s own Anesthetic and Analgesic Drug Products Advisory Committee voting 11-2 against approval. These demands cannot fall on deaf ears; too much is at stake. 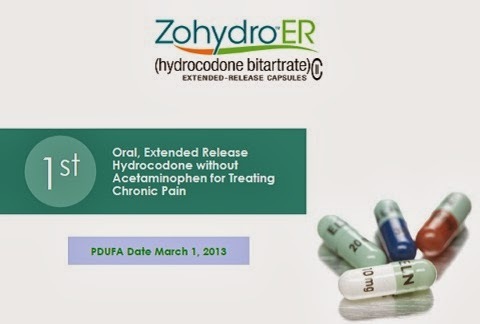 I hope you will agree that there is a pressing need to stop the FDA from allowing Zohydro ER to be sold to the public. The FDA is responsible for protecting and promoting public health through proper regulation and supervision. In this area, it has failed in its duty. That is why I turn to you to either stop the FDA from moving forward in its approval process for Zohydro or require the agency to work with drug manufacturers to incorporate abuse-deterrent technologies into all dangerous opioids introduced to the market. Given the potentially imminent release of Zohydro later this month, it is imperative that you act as soon as possible to keep this dangerous drug off the market.